Welcome to September! We’ve had a couple of cool mornings here in Montana and it gives me hope that fall is on the way. I love sunny days but I could do without the sweltering heat and smoky skies, so some days in the 60s would be fantastic. 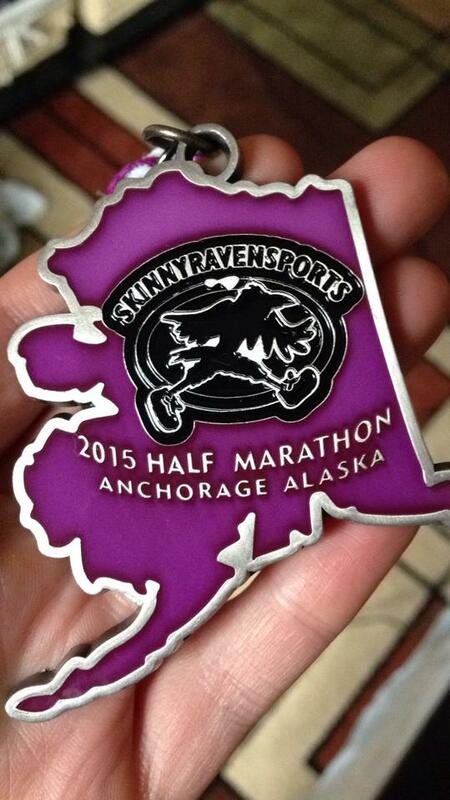 August flew by with a trip to Alaska for the Skinny Raven half marathon in Anchorage and to visit my parents in Juneau. I ran the race with a high school friend and it was easily one of my most fun (and nearly my fastest) race ever. Although it was a fairly rainy 10 days, I had a great time seeing my friends and family and making jam. Luckily for you my mom doesn’t believe in secret recipes so I can share it here. This is my family’s favorite jam and an annual tradition. We typically use any leftover packages of last year’s rhubarb which is a great way to make space in the freezer. As rhubarb is one of the few foods that actually thrives in Juneau, it is usually quite plentiful. I love rhubarb in almost any form, but raspberry is one of its most complementary flavors. Sour rhubarb and tart raspberries are tamed with an admittedly copious amount of sugar. 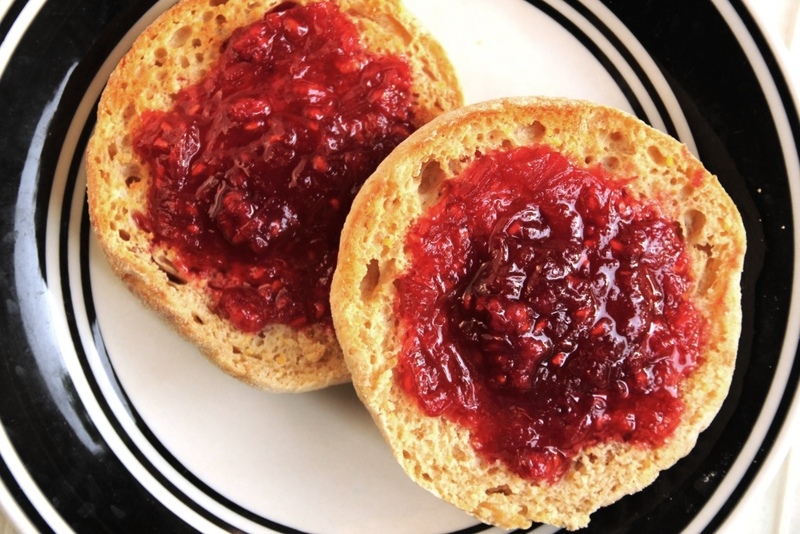 Jam is rarely healthy and this one is no exception, but a small amount goes a long way and it’s much too delicious to bother counting calories. Never made jam before? A little intimidated? Never fear! A Jell-O base makes it an easy recipe for newbies and since it’s a freezer jam there’s no stress about proper canning practices. Just boil, pour, and freeze – easy peasy. I always tend towards the more tart jams, I’ll take blackberry or huckleberry over strawberry or grape any day, but this is my absolute favorite. Excellent as a solo condiment or contrasting with peanut butter, it is sure to fill all your jam needs. Besides the normal uses of toast and PB&J, it’s also great with yogurt or ice cream (especially if your batch turns out a little runny for some reason). Honestly, you can’t go wrong with this jam and I highly suggest you clear some space in your freezer and get to it. A perfect balance of sweet and sour, a beautiful rich color, and an easy recipe are sure to add a go-to recipe to your repertoire. Combine sugar and rhubarb in a large pot, stirring until rhubarb is well coated. Let sit on the counter for about 2 hours. 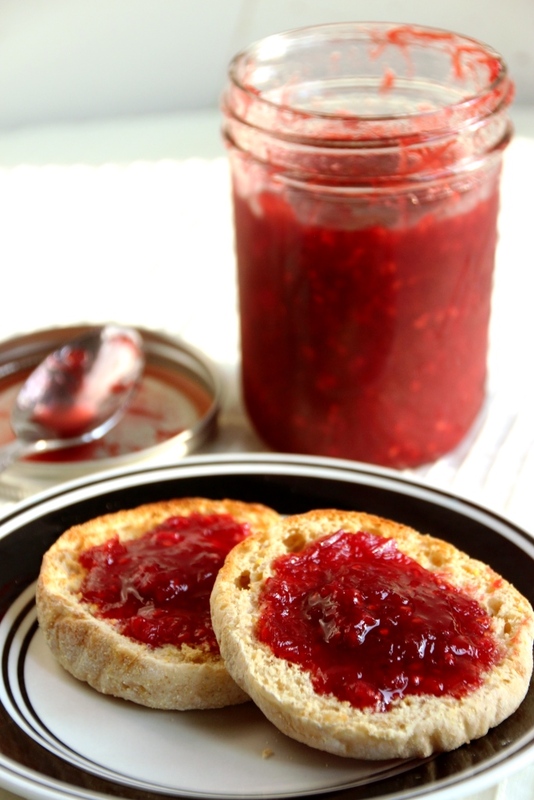 Afterward, clean and boil your canning jars, lids, and rings to clean and prepare them for the jam. Boil rhubarb and sugar for at least 10 minutes (rhubarb should be soft). Stir in the raspberries and return to a boil. Add the Jell-O and stir until completely dissolved. 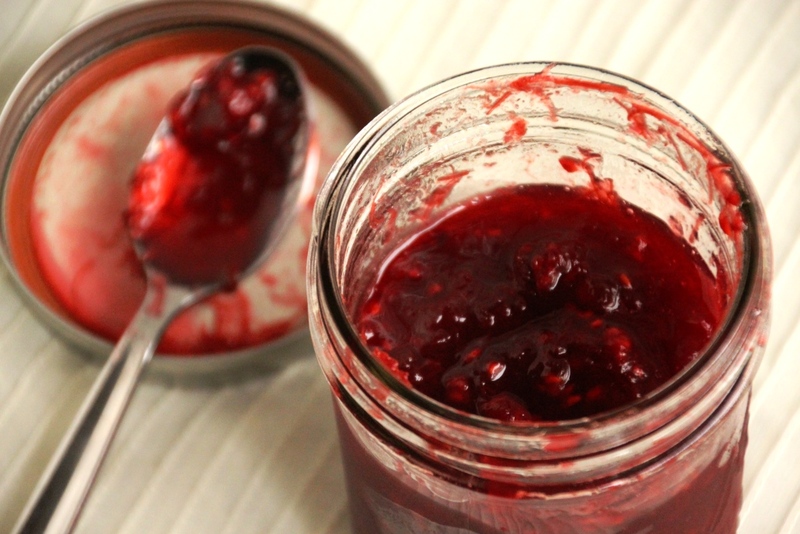 Pour hot jam immediately into canning jars, then put the lid on each one. Leave the rings off. Let cool on the counter until they are comfortable to touch. If the lids don’t all pop, it’s okay. Screw the rings on the jars and store in the freezer until ready to use. Refrigerate after opening; it lasts a long time in the fridge. Enjoy on toast, muffins, cornbread, ice cream, yogurt, in a sandwich or with a spoon. Makes a great gift also! 1 Fresh or frozen. Great way to use up last year’s crop! 2 A little more or less is fine if you don’t see packages of exactly 12 oz, although it will vary your total yield slightly. 3 Use the small size for fresh rhubarb, and the large size for frozen. It doesn’t super matter which one, but it could be a little runny with a small package and frozen rhubarb. If you *need* thicker jam, definitely use the larger box size.